Ecosystem refers to the combination of hardware, operating system, and application purchasing method. There are currently four common mobile ecosystems: Apple, Android, Blackberry, Windows. By far, the two most common are Apple and Android. 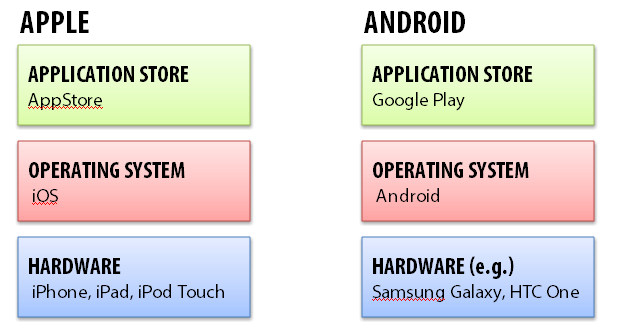 The images below describe the different components of the Apple and Android ecosystems. The two most common ecosystems are the Apple ecosystem and the Android ecosystem. Both ecosystems support a large variety of applications. Apple has more expensive hardware devices; however, the iPad is homogenous making it easier to support with an organization. In other words, the ecosystem is contained with a limited number of hardware platforms and a commitment from Apple to support them. Alternatively, the Android ecosystem supports a variety of devices. The variety of device choices and the lower cost make Android an attractive ecosystem; however, using a variety of different devices increases complexity to the organizational deployment process and increases support costs. Additionally, if an organization is considering building their own applications, the process for including them into the ecosystem must be taken into account. Although it is typically faster to deploy applications to the Android market, the variety of supported platforms means additional effort must go into programming and testing. The choice of ecosystem and devices impacts not only the initial cost of implementation, but also the ongoing costs of the deployment, and all aspects should be fully considered. Generally, you want to have all your mobile devices within the same ecosystem. That is, if you have an iPhone, then you want an iPad. If you have an Android phone, then you want an Android tablet. There are two reasons for this: (1) you only need to learn one operating system, and (2) you can use some of the same apps on multiple devices. The latter can represent a significant cost savings, especially when you have multiple users in the same household purchasing apps for mobile devices. In addition to what you already have, you want to consider what is most common within your workplace and your profession. If more people in your profession use iPhone/iPads, then you will find that there will be more apps available to support your professional work. In addition, there will be more people around to support you in using the devices. Both ecosystems are fully supported on Mac and PC platforms; however, if you primarily use a Mac, you may find that some Android software does not work well on the Mac. The Apple iPhone/iPad work well with both Mac and PC platforms. As mobile devices become less tethered to Mac/PC platforms, your choice of home computing platform becomes less relevant in making your choice for mobile ecosystems.